Premium RCA interconnects for audio components that allow your system to reach its full performance capacity with zero compromises. Soniquil RCA interconnects deliver pristine signal purity. The rejection of interference is ensured through extremely high build quality and design. Soniquil users report experiencing a deeper sound stage and greater musical definition. This cable provides a worthy upgrade to even the most discerning systems. 24K gold plated brass connectors expertly soldered to a high-grade 99.99% oxygen-free copper wire is an essential feature to Raven’s Soniquil cables. In addition, our RCA connectors allow you to twist the end and tighten nicely on to the female connector. This helps solidify the connection between the male and female connectors while reducing the risk of anything becoming disconnected. Our cables are made with multilayer dielectric insulation which helps to reject all RF and electromagnetic interference. This ensures that signal purity is maintained under all conditions. It’s not just good enough to have great signal flow, it’s equally important to make sure you’re not picking up any interference. Audio engineers know that low resistance is a very important factor in delivering an unaltered signal from one component to another. Our cables were designed with this in mind and boy do they deliver. Like all Raven Audio products, our cables are built by expert craftsmen trained to produce the finest workmanship. From computer CNC connectors and special element plating to hand soldering every connection, Soniquil cables are made to last a lifetime. Soniquil audio cables are elegant and beautiful. While designed to have an integrated look with all Raven Audio products they are neutral in color presentation and visually match most any audio component. 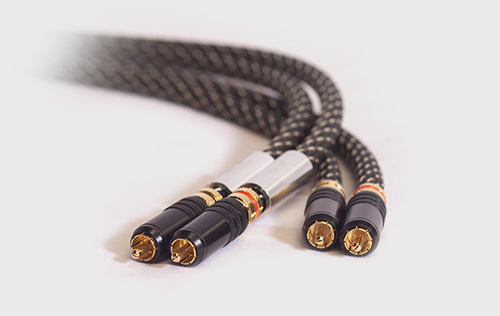 Soniquil cables are sure to elevate both the look and sound of your system. I’ve personally been using these cables since the day they launched. I’m amazed at the build quality and the sound is spectacular. I love the way the RCA connector twist to tighten down and the prices are great.